A renowned South Korean activist for North Korean human rights said Thursday that the North's regime will never give up its nuclear weapons under any circumstances. 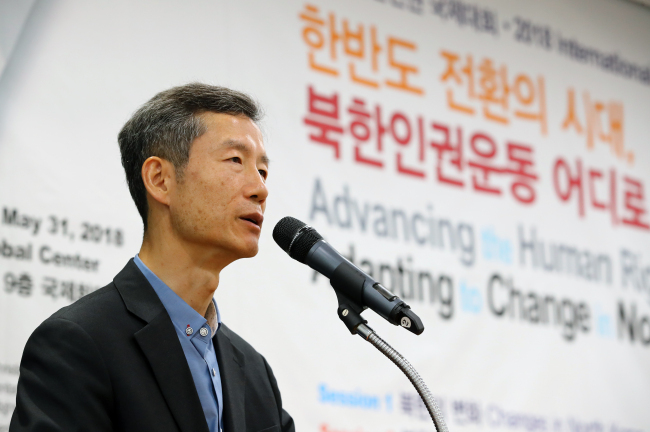 Activist Kim Young-hwan insisted that, while Pyongyang is expected to faithfully implement denuclearization measures as demanded by the United States, it may seek to conceal half of its nuclear weapons. "In bilateral talks, North Korea will yield to the US in many areas. It may accommodate 80 to 90 percent of the US demands for closure of its nuclear test site, suspension of nuclear tests, disabling of nuclear facilities and ICBMs and extensive nuclear inspections," said Kim at an international symposium on the North's human rights in Seoul. "Even if those demands are all met, it is impossible to find the whereabouts of all nuclear weapons in North Korea," he said. Kim was known as a leading student activist in the 1980s who spread North Korea's Juche ideology, but later became an activist promoting democracy and human rights in North Korea. Kim predicted that Pyongyang may see its continued possession of nuclear weapons as especially necessary for its policy of reform and opening. He said the North is very likely to open up and reform, as its leader Kim Jong-un has consistently maintained the policy of protecting and expanding the market over the six years since his inauguration and has basically completed the agricultural reforms. In addition, the state has shown a tendency to protect the capital of individuals in the North, while state-run enterprises pay wages adjusted to reflect market prices, he noted.